THE HUMAN EYE HAS A SOFT SPOT FOR SYMMETRY, for countervailing energies that face off against each other in a composition. Design elements that pit left against right, top against bottom, even corner vs. corner appeal to a certain Math-Bach sense of balance in the universe. And, as does every other kind of visual art, photography builds strong images by “book-ending” elements in opposition, eye cues both tug toward the center and pull toward the edges. Pictures benefit from this tension, this dynamic argument over what’s more dominant, or, more correctly, what’s dominant in this moment. Book-ending between extremes or contrasting forces is a visual kind of debate, a photographic arm-wrestling match. 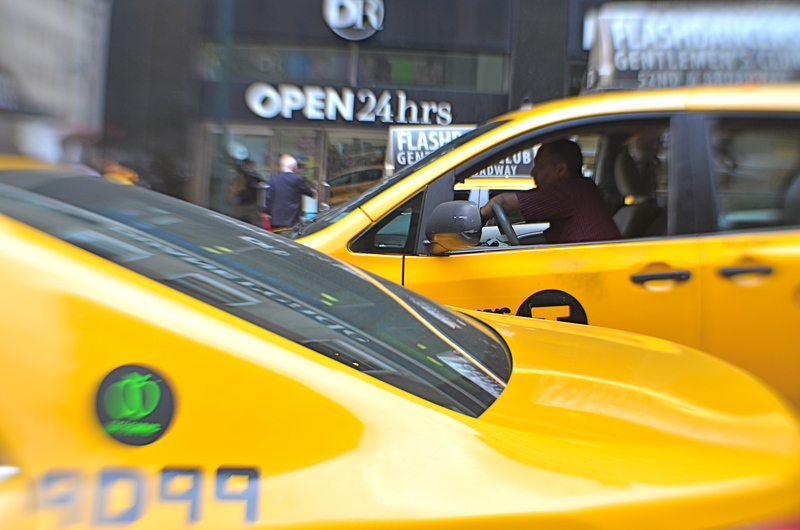 Sometimes shapes or things occupy opposing spaces in the frame are not, literally, fighting with each other, as in the two overlapping taxicabs seen above. Even so, the two yellow wedges at bottom left and top right in the frame are in a kind of balancing act with each other: call it a conversation. In your own work, you’ve no doubt observed this visual tension occurring organically or even deliberately built it into a composition. An old building next to a new one: a tragic mask alongside a comic one: a kumquat facing off against a tomato. It doesn’t have to be dramatic to be effective. The bookends can be ornate Greek warriors or abstract slabs: it’s the opposition in the frame that starts the process of yin/yang, and lends a photograph extra heft. This entry was posted on August 19, 2017 by Michael Perkins. It was filed under Abstract, Composition, Design and was tagged with balance, Framing, Symmetry.